Bungalow in O Rosal, Southern Galicia, Spain - Sublime Position with Sandy Ocean Beaches 10 Mins Drive and Safe Clean River Bathing 15 mins walk. 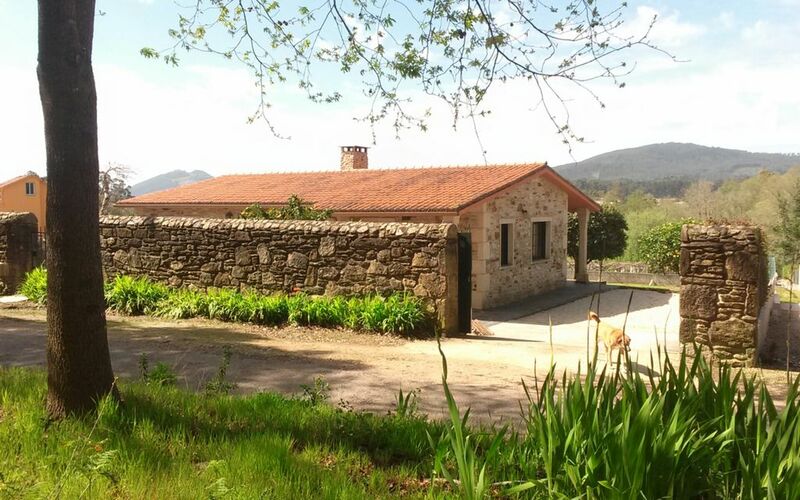 Attractive rustic style bungalow recently built from local stone, in secure extensive grounds, with beautiful vineyards and mountain views. Sublime, peaceful position on the edge of the well known village of O Rosal in the heart of the Albarino wine producing area. Lovely pine clad sandy beaches 10 minutes drive, with a ferry nearby to cross to Portugal and more beaches and attractive villages. It is like having a holiday in two counties at once with the fishing port of la Guardia with numerous tapas bars and restaurants on one side and the contrasting Portuguese style of Caminha 15 minutes away on the ferry. Outside activities abound in the area with walking in breathtaking mountain scenery inland and kayaking, sailing, surfing and white water rafting easy to organise. July and August are full of local Fiestas including the Rosal Wine Fair in mid July and the week long Monte Tecla Fiesta in early August. A perfect base for activity or just peace in lovely surroundings. Large well equipped bathroom situated between both bedrooms with bath and shower over, WC and bidet. Attractive, wood beamed living room with granite fireplace and wood burner. Comfortable sofa and other seating, together with satellite TV, with patio doors leading onto terrace with gorgeous views of vineyards and mountains. Well equipped kitchen diner with large breakfast bar and granite work surface. Electric cooker and hob, refrigerator, microwave and washing machine. Covered outside terrace with views of vineyards and mountains. 45 minutes drive to Monderiz, Vigo and Ponte de Lima golf courses. Outside: The bungalow is surrounded by a small one level terrace on all sides with garden chairs and sunbeds which can be placed in the sun or shade and still get views. Fruit trees, including oranges and lemons, and pretty flower borders to the side with a large open lawned area with the views in front, with a vineyard just over the wall. Cleaning / Towels / Linen / Maid service: Bedlinen and bathroom towels included. Beautiful house and beautiful location! Thank you so much Robin for such a lovely stay. The house is perfect - peaceful, clean, spacious (even with a toddler) and fitted with everything you could need. Robin was incredibly welcoming and was so helpful with any questions we had. The region is just beautiful - incredible beaches - white sand, cold but clear water, pine forests running down to the beach. Beaches are just 10 mins away and on the Portugese side 15-30 mins gets you some gorgeous beaches (and Portugese custard tarts!). Within walking distance of the cottage there are fantastic river pools for swimming and picnics. We filled two weeks with delicious food, swimming, relaxing and exploring and could happily have stayed the whole summer long. Highly recommended! Nos ha encantado pasar unos días en esta agradable casa. Desde que entras te encuentras como en tu hogar, todo el menaje es perfecto, no le falta de nada. El jardín, con dos ambientes maravilloso y cómodo. La tranquilidad que se respira, el bosque cercano, las vistas, todo, es perfecto. Respecto a Robin y Deb, decir que han sido unos anfitriones muy atentos en todo momento y siempre intentando ayudar. Sin duda recomendamos este lugar tan maravilloso. We stayed in the comfortable cottage for 9 days in the middle of a three week holiday travelling throughout northern Spain. It was a delightful place to completely relax and yet there were plenty of things to do within a short drive. Robin who manages the property was a mine of local information and helped us to make the most of our stay. Loved it! We've just had our first holiday in Galicia and will definitely be returning. We loved the property with it's wonderful views. It was both relaxing holiday and with plenty to do. Our teenage children particularly liked the river swimming. Our host Robin provided great recommendations for activities and places to visit and eat. The food was great especially the fish and tapas restaurants. Our children loved the cottage and the garden. The cottage was very well equipped and the layout suited our family. We found Galacia to be full of friendly people, great value for money, lovely scenery and with lots of interesting places to visit. We would love to visit again and would definitely recommend this cottage and part of Spain. We had a very pleasant stay in this beautiful house, well cleaned, with a nice garden. It was perfect to spend relaxing times. Kids enjoyed sleeping in the well decorated room. We just love it. And Robin was a good host ! Thank you Isabelle and Florent. We enjoyed having you and your family as guests. Sandy pine clad beaches 10 minutes drive on Spanish side of Rio Mino. Countless sandy coastal beaches 30 minutes on Portuguese side using the ferry or newly built bridge at Goian. Picturesque picnic area and river bathing pool with crystal clear water 10 minutes walk. one hour twenty minutes drive. Competitive car hire available at all of these airports. Santander and Bilbao ferry ports are 7/8 hours drive. O Rosal under 5 minutes drive. La Guardia with Celtic Village, fishing port, beaches and seafood restaurants 10 minutes drive. Historic Tui 30 minutes drive and cross to Valenca (Portugal)on Eiffels bridge which takes another 10 minutes. Cruise port city of Vigo is 45 minutes, Vila Nova de Cerveira 15 minutes with a Saturday market too good to miss. The pilgrim city of Santiago de Compestela is one hour and twenty minutes drive with cathedral and ancient streets.